DARPA’s Hydra System: The Many-Headed Sea Monster Goes High-Tech and Robotic | DefenseReview.com (DR): An online tactical technology and military defense technology magazine with particular focus on the latest and greatest tactical firearms news (tactical gun news), tactical gear news and tactical shooting news. The U.S. military has been suffering lately from budget cuts due to sequester/sequestration. It hasn't been pretty. So, the military is having to get a bit creative in turning lemons into lemonade. Enter DARPA's (Defense Advanced Research Projects Agency) Hydra System. 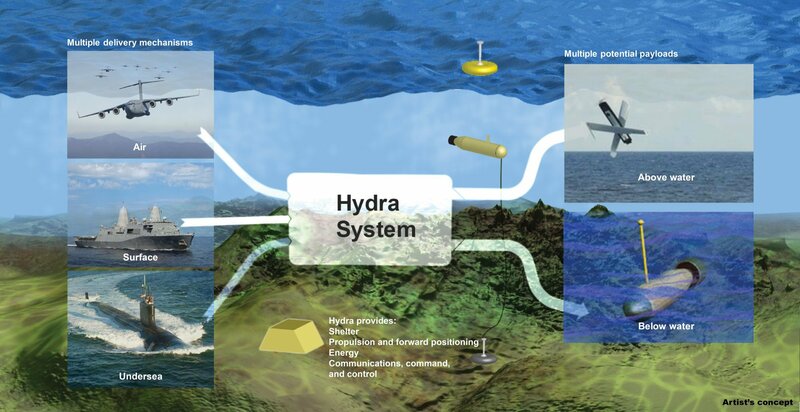 Named after the many-headed sea monster of Greek mythology, Hydra would create a network of marine platforms, including unmanned underwater vehicles (UUV's) to compliment our arsenal of UAS/UAV/drone aircraft and unmanned ground vehicles (UGV's), i.e., ground robots. Hydra would include a network of submarine/undersea "unmanned payloads and platforms" comprised of Intelligence, Surveillance and Reconnaissance (ISR) and Mine Counter-Measures (MCM) systems (outfitted with advanced/sophisticated sensors) and, presumably, armed/weaponized unmanned underwater systems (armed with gun systems, torpedoes, mines, etc.) that would be capable of search and destroy type missions, as well. So, enemy ships, enemy divers and pirates beware, because a little weaponized robotic monster may just be swimming around underneath you in the future. Imagine being an enemy diver or sailor and having a little high speed Hydra system outfitted with an underwater gun system loaded with DSG/PNW Arms MEA (Multi-Environment Ammunition) supercavitating ammo pull right up on you–or underneath you–and opening fire on you. That would pretty unpleasant, no? But back to the budgetary angle. "The climate of budget austerity runs up against an uncertain security environment that includes natural disasters, piracy, ungoverned states, and the proliferation of sophisticated defense technologies," says Scott Littlefield, DARPA program manager. "An unmanned technology infrastructure staged below the oceans’ surface could relieve some of that resource strain and expand military capabilities in this increasingly challenging space." That, of course, sounds good, except we'll see just how cost-effective Hydra is. Costs of so-called low-cost or cost-efficient U.S. military programs have a weird way of getting quickly out of control. Next: Harbin BZK-005 Drone Intercepted by Japanese F-15 Fighter Aircraft: Are the Chinese Close to Achieving UAS/UAV/Drone Aircraft-Parity with the United States?